Heavenly Ascent- The Grandfather Mountain Trail to the Top of the World! Shortly after I arrived in the High Country, my buddy and I would love to head over to Grandfather Mountain. There were no trails, so we just blazed our own. 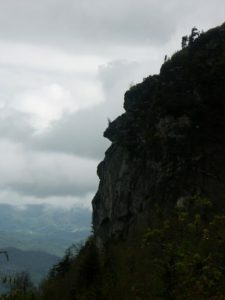 Our goal: to make our way to Calloway Peak, Grandfather Mountain’s highest peak. 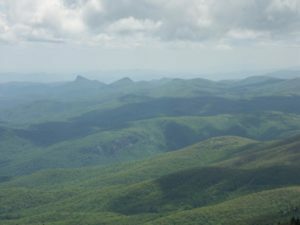 Calloway Peak is also the second highest peak in the Blue Ridge range, at 5,946 ft. As a young man it was a riveting experience to blaze the terrain and then stand, supreme, on what felt like, the top of the World! Granfather Mountain is often referred to as the Granddaddy of the Appalachians! Since my hay day, they have created several trails along side and inside the regional treasure. 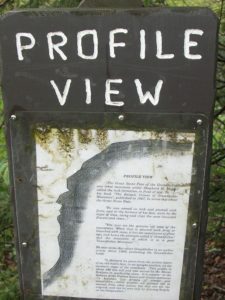 One of which, the most similar to my personally blazed trail, is the Profile Trail. The trail was conceived and designed by the late Jim Morton (son of the late Hugh Morton, patriarch of Grandfather Mountain). Jim and his friend, Kinny Baughman set out to make the trails using nothing more than hand tools – iron rods, shovels, pulleys, and winches. Real Mountain Men Style! Now that I am a granddaddy, I thought I would celebrate a milestone birthday by attempting a solo ascent. I wanted to try re-live the adventures of many years ago. Fortunately, today there is a great way to attempt the challenge: The Profile Trail!!! Luckily I was able to drive to the brand new $1.8 million parking lot and trail access that just recently opened 14 days earlier. At 8:00am on a bright and sunny July 15th, I was able to begin my quest for Calloway Peak. At 9:52 am I was standing on top of the world once again. The view was breathtaking (as was the climb) views of the land below. The round trip hike is slightly over 7 miles and the vertical gain from start to the top is almost 2,100 feet. Allow 4 to 6 hours for the journey, pack a lunch and a bottle of water (although you can get pure spring water along the trail close to the top). Bottom line, this needs to be on the bucket list for every nature-lover!